Sweets have been an indispensable part of man’s diet since time immemorial. Whether the chewing of sugarcane or munching on a fruit by a pre historic man, or tasting a lemon soufflé or a cassata by the modern sophisticated one, sweets have been a universal favorite. A majority of people have a sweet tooth and love to munch on sweet concoctions. India has been the land of an endless variety of sweets, made from a mind boggling assortment of ingredients. While your grandmother may have dished out a number of varieties of ladoos or kheer, today you can whip up a creamy soufflé, a luscious apple tart or a layered trifle in a jiffy. Modern gadgets, easily available foreign ingredients and innovative ideas have also helped to increase the variety of sweets today. Unlike in the West, where sweets are usually served as a dessert, in India they find their way into breakfast tables and lunch boxes and are also used a s a filler in between meals or as a snack. In traditional Bengali households a bowl of white spongy rashogollas is a must on the breakfast table while in Bihar, Rajasthan and Gujrat, halwa is often present along with other breakfast items. No festival, religious ceremony, wedding or even the culmination of a business deal in India is complete without the mandatory mithai. The Chandidas Padavali written around the 15th century describes how on Lord Krishna’s birth his father Nand distributed various kinds of sweets (bibidha-mishta and sakar mithai) among friends and neighbors. Other literary works of the 16th century also mention such sweet preparations as chhanabora, khaja, jalebi, modak, malpoa, sitamisri and sandesh. Lord Krishna as a child is depicted as a lover of butter and sweets. India is a land of festivals and down the ages particular sweets have been associated with special festivals. For example, who can think of celebrating Holi without the delicious gujiyas with their mouth watering khoya filling? Similarly Diwali being a winter festival is usually associated with sweets made of or including dry fruits. 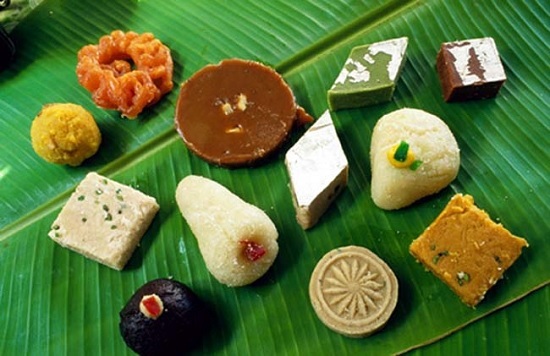 Modaks are indispensable for Ganesh Chaturthi while Durga Puja in Bengal is associated with different types of sandesh. Id means little without the traditional seviyan garnished with dry fruits. Laddus and boondi are indispensable parts in most Pujas as offering to God and then distributed as Prasad to devotees. Since the rural India of ancient times had an abundance of rice and milk readily available, housewives used them in various ways to create sweet dishes. While the kheer, payesh or payasam made of rice, sugar and milk is popular all over India, it has several variations. In Bengal during the month of Pous (Dec-Jan) fresh jiggery is used instead of sugar. Kheer is also made with sago, makhana (lotus seeds), seviyan (vermicelli) and even louki/pumpkin. Necessity is rightly called the mother of invention. Man has always innovated to create delicacies out of readily available ingredients. The most popular sweets of the coastal areas include coconut as their main ingredient. India offers a variety of sweets for the connoisseur which differ in taste, texture and ingredients from region to region and even from season to season. While sweets made of dry fruits rule the roost in winter, lighter sweets are more popular in summer. With the introduction of foreign rule in India the traditional ways of making sweets were influenced in various ways. For example in Bengal sweet making was developed into a fine art and most of the traditional sweets were made from thickened milk. However with the coming of the Portuguese (about 20,000 of them settled near Hooghly) new methods of sweet making were evolved. They loved cottage cheese which they made by curdling milk with acidic material. This technique helped the traditional Bengali sweetmeat maker to make sweets with a new raw material, chhena. The British rule in India has also influenced our sweet making, which has become anglicized. Chocolate barfi is a gift of the British. Custards, pies, tarts, cakes and jellies began appearing on Indian tables. Today traditional Diwali sweets have been replaced by a box of delicious, mouth watering Swiss chocolates. Pastries, tarts and canapés are preferred over laddus, barfis and malpuas. The health conscious can go in for fruit based concoctions while there are sugar free sweets for the diabetics. Thus India can rightly be called the land of sweets. A lover of sweets will be spoilt for choice. The range of sweets available throughout the length and breadth of the country is mind boggling and no traditional Indian meal is complete without a sweet. And so cheap in price to spread a party table in variety - that was India in the 1950's. Now, in the UK, a single sweet - say a piece of burfi -can cost almost a hundred rupees in exchange terms. Pani puris are £2.50 a portion of five - that is 200 rupees, then the cost of tweed suit for boarding school. In the west, it is the idea one pays for not the substance.